If you are looking for something special, this is it! This stunning top floor, end unit was recently remodeled. 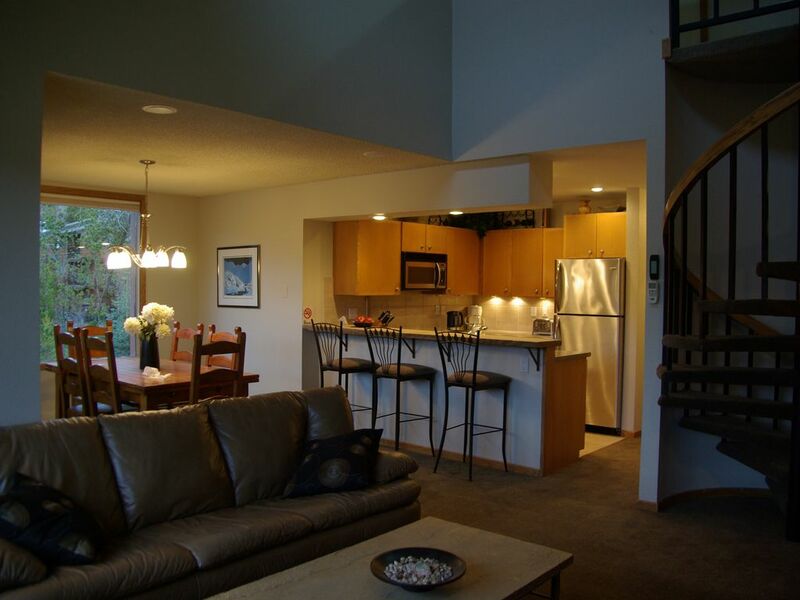 This unique condo is located in prestigious Snowblaze Condominiums. An easy walk from condo to shops, restaurants, bars, ski and bike shops. SnowBlaze Condominiums are known for their excellent location as well as access to a complete health club featuring an indoor pool, indoor and outdoor hot tubs, weight room and cardio equipment (treadmills and stair masters). Our exceptional end unit features vaulted ceilings, no common walls to any other unit, a private in-unit sauna, leather furniture, two bedrooms with king sized beds and a third bedroom with a double/single bunk bed and a single trundle bed. Snowblaze is located on the free shuttle to the ski area which is 5 minutes away. Winter Park offers no better location and Snowblaze offers no better condominium than ours. This condo is not offered on the 'rental pool'. It 'looks and lives' like a private home. We are avid outdoors people enjoying skiing (naturally!) as well as hiking, camping and fishing. Colorado offers many opportunities for outdoors fun and adventure, and is a main reason we call this home. Our children grew up on Colorado outdoor adventures and have continued to do so into adulthood. Living in Boulder, CO we wanted a place in the mountains for easier access to our favorite outdoor activities. Snowblaze Condominiums provides us (and we hope you) the perfect combination of access to ski resorts, national forests, mountains, lakes, rivers and campgrounds, but with the added benefit of being in a town. Although small, Winter Park offers a diverse set of restaurants, bars, shops and entertainment. And throughout the year there are various festivals and events. Our third floor unit provides breathtaking views, solitude and relaxation. We can access fly fishing on the Frasier River in less than 10 minutes, bike or hike out of our parking lot to the trails around town, and catch the shuttle to ski slopes out front of the building (5 minutes to the hill). Or walk to several good restaurants (try Smokin' Moe's BBQ for the best ribs and pulled pork around, or the Ditch for great Mexican, beers and music, or the Vasquez Creek Inn's Italian coffee and deli treats), or rent a bike or get your skis tuned at several shops within two blocks. The Indian Peaks Range form the local part of the Continental Divide with numerous peaks between 11,500 and over 13,000 ft. for hiking, mountain biking, Nordic skiing, camping, and fishing. Dramatic views of the Continental Divide Mountains, including James Peak (13294 ft / 4052 m), and Roosevelt National Forest. When it comes to amenities, nothing compares to Snowblaze; vaulted ceilings, great views of mountain range, third floor, two levels, private balcony, in-unit private sauna, main floor lockable ski locker, private health club membership on site. Stephen and Annette went above and beyond in providing everything we needed. The cookware was luxurious. Speaking of above, yes it's on the third floor but that is what provides the beautiful picturesque views out of the very large picture windows. It's a wonderful condo for large families. My wife was in heaven as she stayed home while we skied. She had all she needed to prepare our evening meals to help save money. Would love the opportunity to stay here again. We have been coming to Winter Park for years and have stayed in many different condo complexes. This condo was a great location to be close to all the amenities in town but right on the Fraser River Trail where we could walk to Idlewild quickly where we had other family camping. Our party included two couples with four kids and babies; we liked that both bedrooms had a king bed for the parents’ comfort. The couple sleeping in the main level bedroom said the mattress wasn’t very comfortable, and the upstairs bedroom is a loft, which I missed on the description, which wasn’t ideal when the baby was going down for a nap or bedtime. However, the condo was clean, towels were plush and plentiful, we enjoyed the spiral staircase and HUGE windows and deck, and the kitchen was fully stocked, with great wine glasses, not the cheap tiny ones you typically find in condos. We would stay here again. Thanks so much for a great stay! We enjoyed staying at this property. The owners were very responsive. All instructions and guides for the property were documented and detailed for the property. The condo was clean, had plenty of space for 6 adults and was in a great location. The only downside was the climbing up and going down the stairs. We had one person who has a knee injury and it was pretty tough on them going up and down the stairs. Place was perfect for our summer family getaway! This was a perfect location with great accommodations and plenty of room for our family. We went to WinterPark for Spring Break to enjoy quality time with our two daughters. The location of the property was excellent and the condo itself was very clean and comfortable. We took advantage of the heated pool and hot tub after skiing and it was wonderful. The only thing that we did not enjoy was walking up several flights of stairs carrying our luggage etc. Overall, we definitely enjoyed our stay and were pleased with the property. We had two couples and four kids comfortably in this condo. Plenty of space so that people are not right on top of one another and can relax. The sauna was a nice bonus! Snow Blaze is right on the Winter Park bus line that picks up in front of the building and drops off at the Cabriolet. The owner was very helpful throughout the process! Snowblaze Condos - Pool - Health Club - Downtown Winter Park.